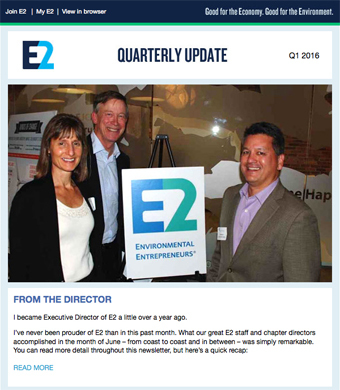 NRDC’s Environmental Entrepreneurs (E2) is a project that brings business leaders from across the country together to advocate for policies that are good for the environment AND good for business. The impact is significant as their voice is unique — strong environmental policy advocates but also individuals whose businesses produce significant employment and tax revenues. The project is based on a national membership of thousands of large donors. E2 faced challenges with donor development at a point where they were rapidly expanding their advocacy efforts and membership. I’m working with E2 staff on improving their acquisition and retention strategies while honing the design and content of their current channels of communication. First up a redesign of their email blasts to employ a more engaging design, but more importantly to address usability for non-desktop users. The new design significantly improves readability and click-thrus and uses an adaptive approach that increases font size for tablet & mobile users.